These piping systems let operators move gases and liquids from compartments safely and securely. 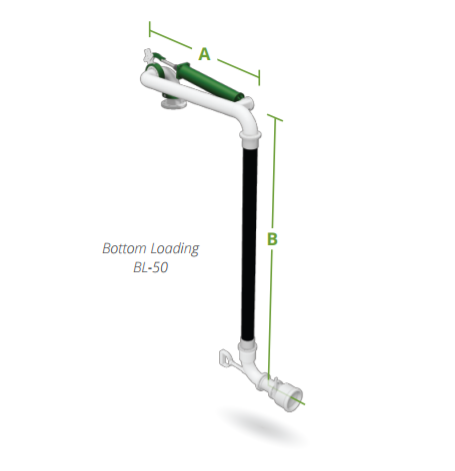 More efficiently transfer bulk gas and liquid at your operation with Excel bottom loading arms. Arm-Tex offers a complete line of Excel bottom loading arms that can help you more efficiently and securely load and unload petroleum products, chemicals, and liquefied gases such as LPG, LNG, and propane. This is especially relevant if your operation is limited by space, mounting arrangement, and transfer height. Since bottom loading takes place on the ground, operators don’t have to worry about falling off of vehicles. 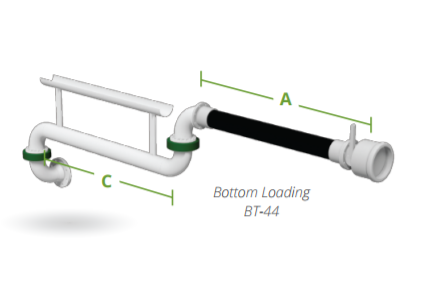 Bottom loading systems also create less turbulence in tank compartments, curbing the generation of static electricity, and their linear spring design lets it fit into tighter spaces and carry more weight than any of its competitors. They’re also efficient—you can load multiple compartments simultaneously with bottom loading systems. Meanwhile, you can reduce vapor leakages since these loading systems can be adapted to recover displaced vapors during the loading process. That means you don’t have to worry as much about environmental hazards, harm to workers, or loss of product. 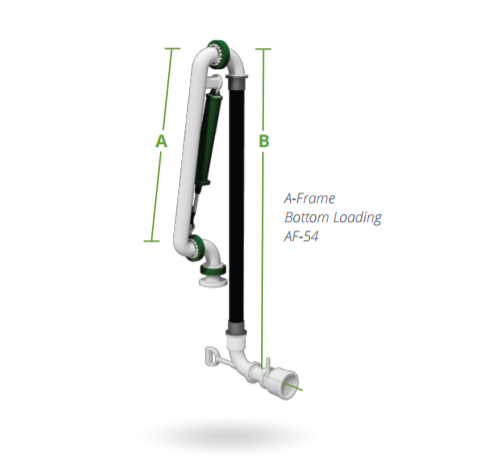 AF-54 bottom loading arm has an A Frame Design which is great for confined spaces and use in applications where multiple products are loaded into trucks in the same bay. An AF-54 is great to store primarily in a horizontal position. 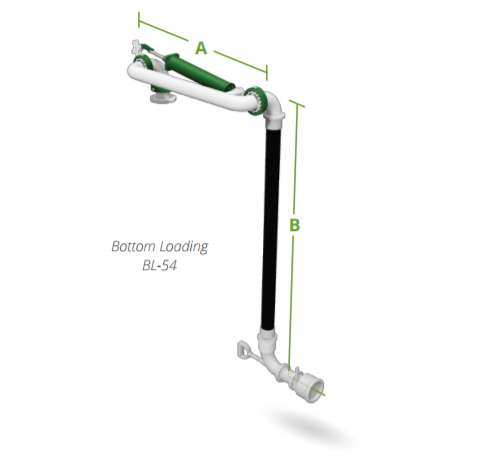 BL-54 arms require less overhead space since it stores primarily in a horizontal position, depending on the piping layout or environmental obstructions. They rotate above and below horizontally to reach the connection point on the compartments, so they require more space adjacent to the arms for storage. For spaces where storage space is laterally available and loading and unloading take place near the ground, the BT-377 and BT-44 are great choices. The BL-50 is similar to the AF-54 but require less overhead space and more adjacent space for storage. 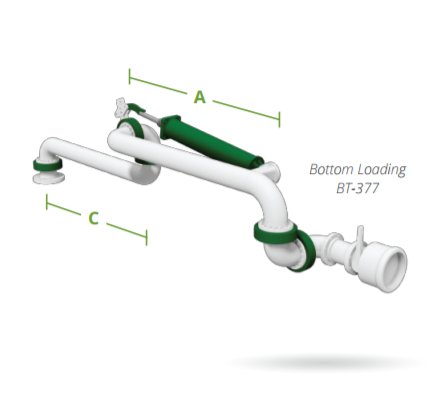 For more information on how Excel bottom loading arms can benefit your operation, reach out to one of our experts. Arm-Tex has over 25 years of experience in the industry and can provide excellent guidance for projects of all types and sizes. We can give you the equipment you need to create the perfect bulk loading and unloading system for your operation, and all at a competitive price. Contact us today!